This week's lesson's structure was as follows: first we learned basic, simple meter signature differences with embodied methods. The children were learning the difference between common time and three-four time signatures with a song that included both of these signatures first introduced apart, and towards the end of the song, combined. Both of the signatures were labeled with certain movements (common time was for 'the pixies' and three-four time for 'the fairies' / Elina Kivelä-Taskinen; Rytmikylvyn Pikkukuplat). After that we continued with 'lysti leikki'- song and some drama educational methods. Afterwards we've acted the song with the emotions of sorrow, anger and happiness we discussed how these emotions affected e.g. the tempo or other dynamics of the song. We talked how our emotions affect the dynamics of our behaviour in 'real life' also. 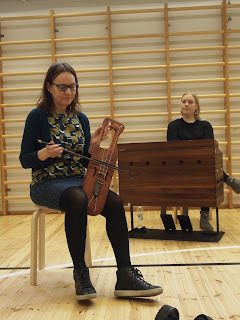 As an ending for the lesson we concentrated on one specific song of the four ones we are preparing for the spring concert (from Pikku-Marjan Eläinlaulut).